Let's be honest… when planning our trip to Thailand, the thing Jenn was most excited about was the Pad Thai (this might have even influenced our decision to go there). For instance, while traveling in Argentina in September, a sudden craving for that delicious, spicy rice noodle dish struck and it struck hard. We searched desperately from restaurant to restaurant to no avail. It wasn’t until we returned to the US that we got our hands on some quality Thai food. 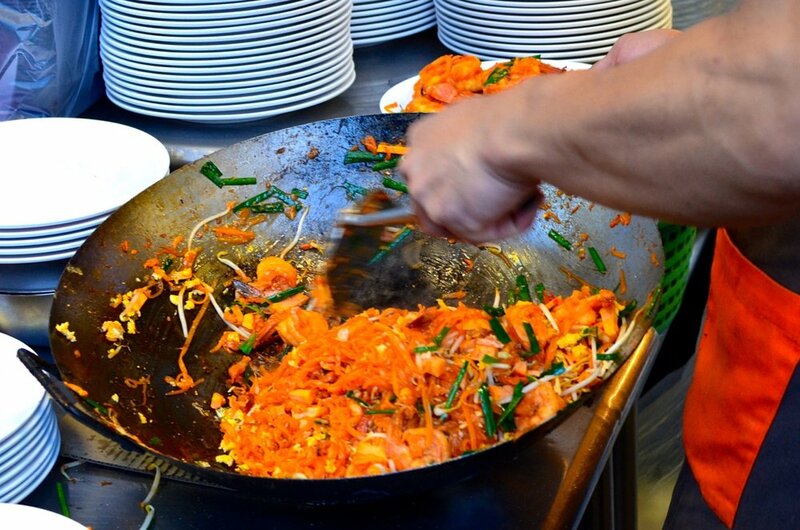 So knowing we’d be in Thailand, where this legendary dish originated, sparked great excitement. Jenn imagined Pad Thai for breakfast, lunch and dinner! When we got to our first Thai destination, one of our first Google searches was ‘Best Pad Thai in Bangkok’. 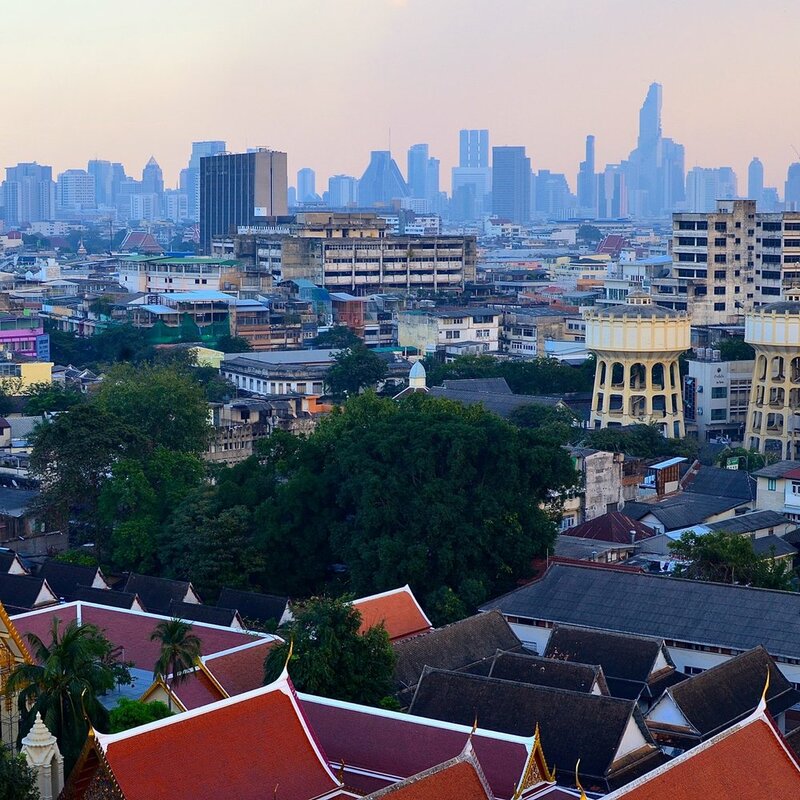 The results were unequivocal: a place called Thip Samai, in a corner of Bangkok received this honor from locals, tourists and travel publications alike. Our mouths watered as we made our way to what seemed like a small, unassuming local eatery. It looked just like all the other local shops, making us wonder if we were even in the right place. But the walls plastered with awards and clippings from features by CNN, BBC, and National Geographic assuaged our doubts. We ordered the famous Pad Thai, which showed up within minutes—piping hot, spicy goodness wrapped neatly in an omelet. They provided all the fixings: chili flakes, lime and a bucket of crushed peanuts to add to the unique sweet, spicy and savory flavor profile that makes this dish so special. Liked it so much we ordered seconds. Definitely the top Pad Thai we’ve ever tasted (we’re not calling the search just yet though—the process is just too delicious). Great food isn’t all that Thailand had to offer, of course. We had an amazing few weeks exploring this beautiful and diverse country. 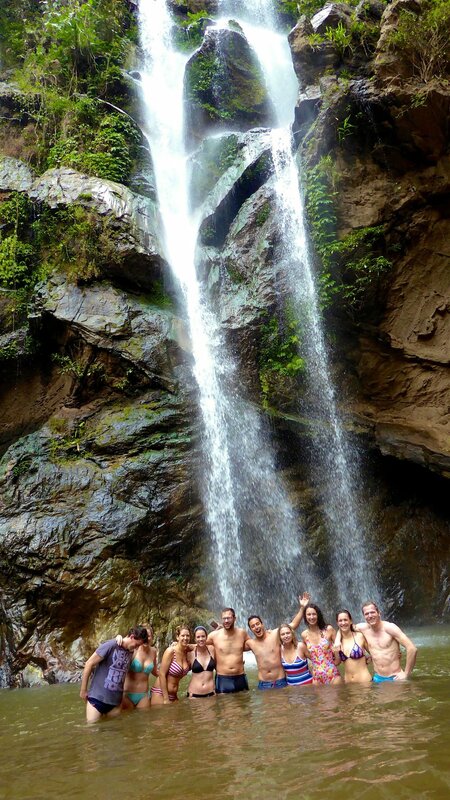 Check out our Wanderlist below to hear about some of our favorite experiences. Perhaps the only instance in which us world travelers are justified in feeling sorry for ourselves is being away from our families for extended periods of time. This was the first time in Rolando's life that he had been away from Guatemala during Christmas, and the second time Jenn had been away from Cleveland. Since a flight to and from that side of the world was cost prohibitive we decided to make the most of our Asian Christmas, opting for a quiet and secluded holiday on an island in Southern Thailand. Southern Thailand offers a plethora of paradisiac, sun-kissed islands, each with their own unique characteristics. 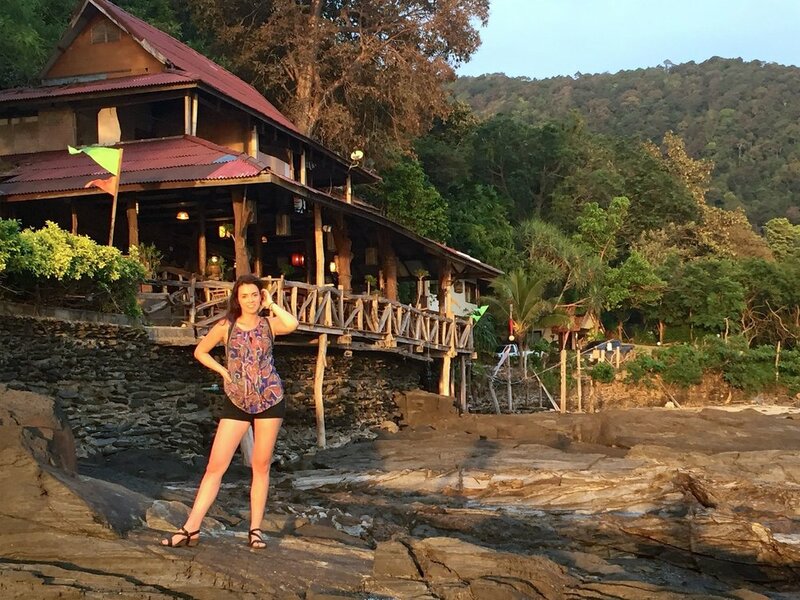 We were seeking beautiful scenery, abandoned beaches and a laid back atmosphere, making Koh Lanta the perfect choice for us. We nested up on the south of the island—where few tourists traversed—in a hotel that overlooked Bamboo Beach. Just a short walk down a hill was a secluded and pristine beach where we bathed in warm, pool-like water, sipped fresh fruit smoothies from the little restaurant hut and made sand men from the white sand surrounding us (snow men were harder to pull off). We enjoyed a peaceful and relaxed Christmas. 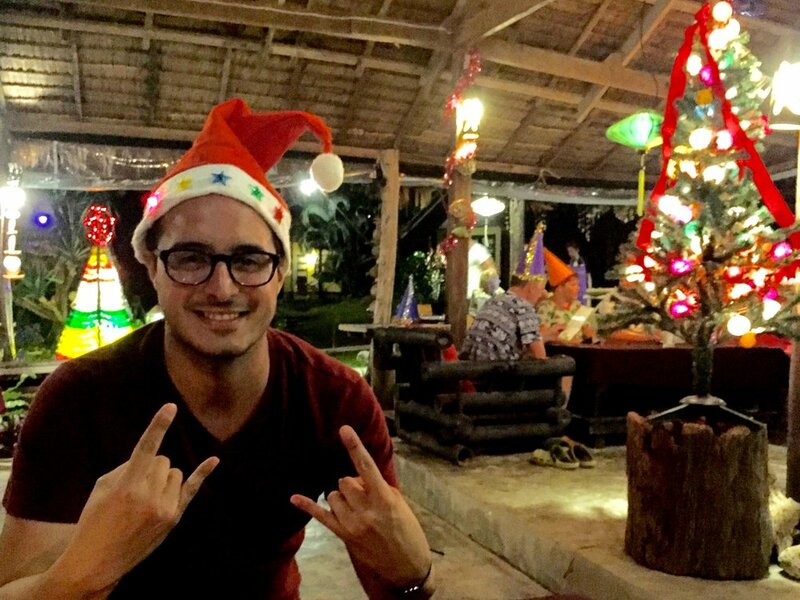 At night we went to a neighboring resort for their Christmas dinner celebration complete with décor, Santa hats and music. Then we went home and Skyped with our families. We shook off our self-pity and decided to be thankful for each other, thankful for our experiences, and thankful that modern technology allowed us to celebrate (if only for a few minutes) with our family a world away. 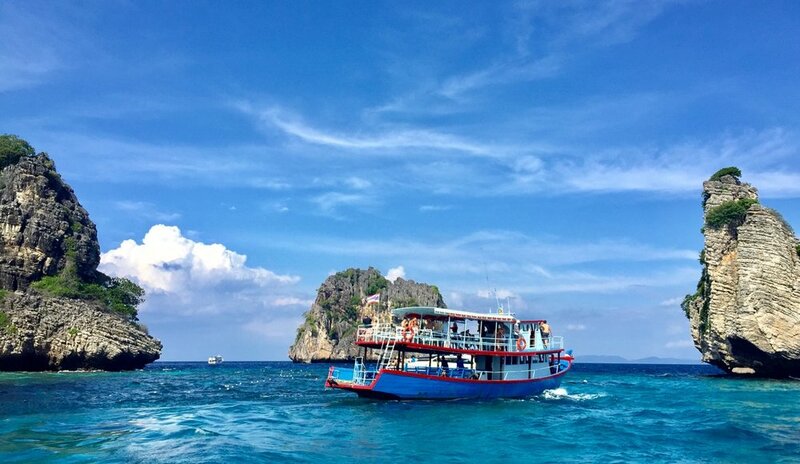 From what we heard from others, no journey to the South of Thailand would be complete without a visit to Phuket, the most famous and visited of all the islands, one most notorious for its raucous party atmosphere. This would be the perfect place to ring in the New Year. We arrived a few days before New Year’s Eve. The island looked much more developed than Koh Lanta. 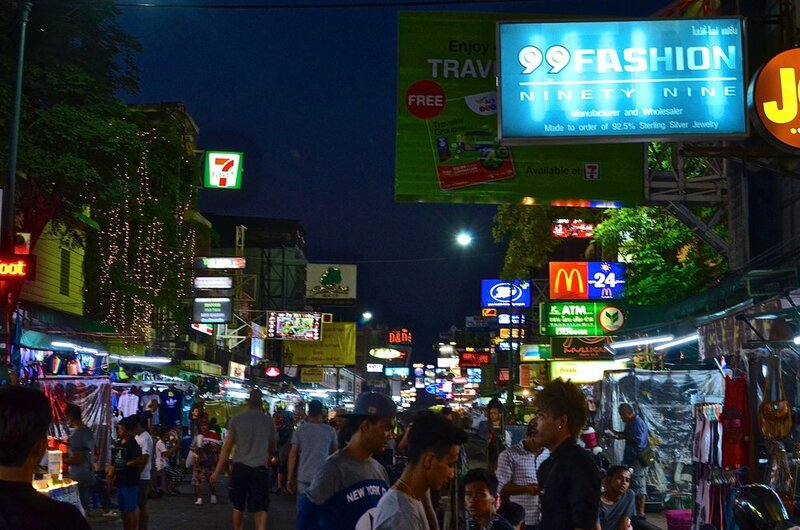 Streets lined with tuk tuks, restaurants, street vendors selling their goods, and thousands of "massage parlors" (which we suspect were unfortunately fronts for a different type of business). As we walked further into town away from our secluded hotel, we found the main street, which was overwhelming. Bar after bar after bar, hundreds of tourists taking part in the very much liberal atmosphere. We got back to our hotel exhausted just by the sight of the craziness. We decided to save our energy and avoid the party scene until New Years Eve. We spent the rest of our days there snorkeling, relaxing at the beach and exploring the surrounding hills. After that we followed the crowds to the center of town, where the street lined with bars and ran perpendicular to the beach. Every bar was absolutely packed with happy people waiting to ring in the New Year. Street vendors sold flashing head pieces and cans of silly string by the dozens. We inched our way toward the beach, ducking for cover from the flying silly string and engaging in our share of silly string sneak attacks. Once at the beach we nabbed a beer and sat down amongst the crowd of thousands overlooking the ocean. 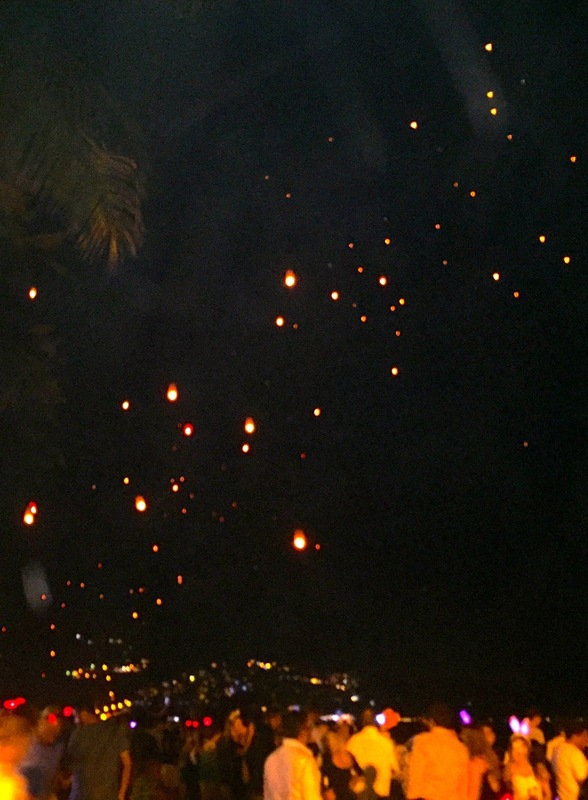 Hundreds of paper lanterns were lit and released into the sky, lighting it like a hundred stars rising into the night. At midnight we stood, counted down together, and cheered under the bursting fireworks. 2016 had been good to us; we promised each other we’d work to make 2017 even better. 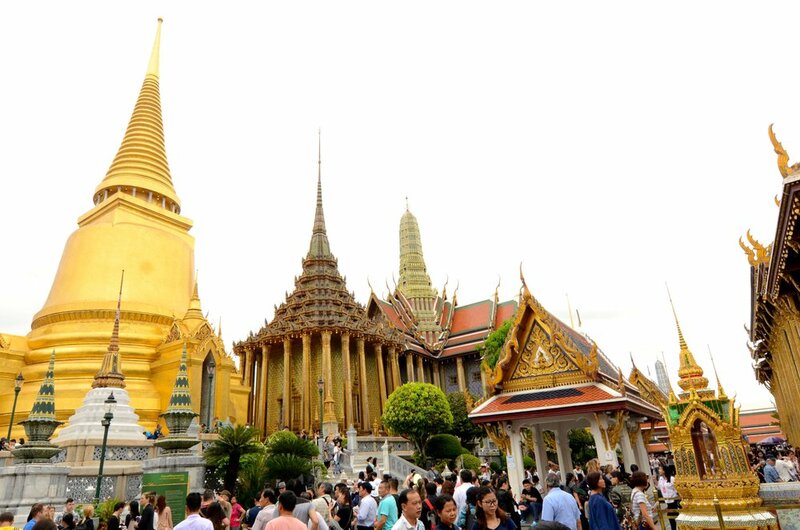 With a record-breaking 32.5 million tourists visiting in 2016 (the number tripled in the last 10 years), Thailand is becoming quite the tourist destination. What has resulted is a blessing and a curse: a wonderful tourist infrastructure has boosted the economy as lots of quality hotels and transportation options arose. However, there are places that (in our opinion) often exude an excessive “touristy” vibe—western restaurants everywhere, hoards of foreigners being herded into buses and boats in an impersonal, transactional manner. 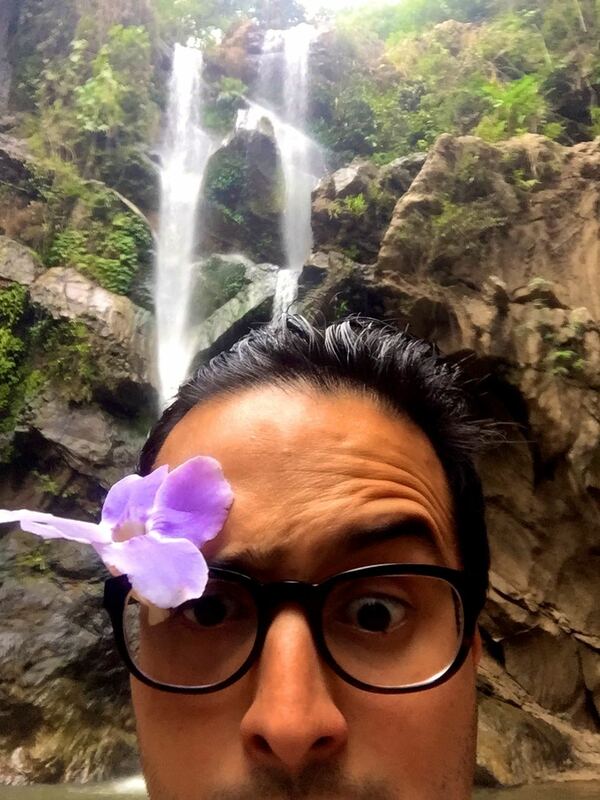 To get out of the tourist hustle, we decided to take a three-day, two-night trek through the jungle of Chiang Mai with a company called "Piroon & Jitt.” We longed to go out and get to know the “real” Thailand. We were picked up from our hotel at the crack of dawn with nothing more than a small backpack with the items we’d need for our journey—clothes for two days, a towel, some bug spray. We hopped in the back of a truck and wound our way up the mountainside for nearly an hour. Our truck stopped in the middle of the jungle and our guide Sun told us we were ready to start our journey. So the trek began up and down and through the jungle on a thin path worn in by the villagers who have journeyed here before us. Every once in a while we’d encounter a clearing in the trees that’d give way to a breathtaking view of bright green rice fields below. Along the road we saw giant spiders, termite mounds and well-worn highways of millions of ants winding as far as the eye could see. 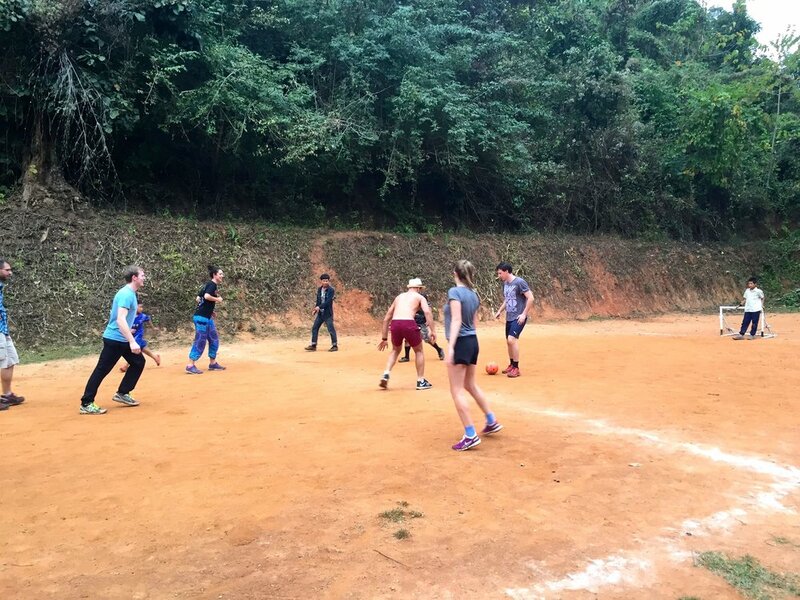 After hours of trekking we found ourselves in a remote village In the middle of one of Thailand’s national parks. 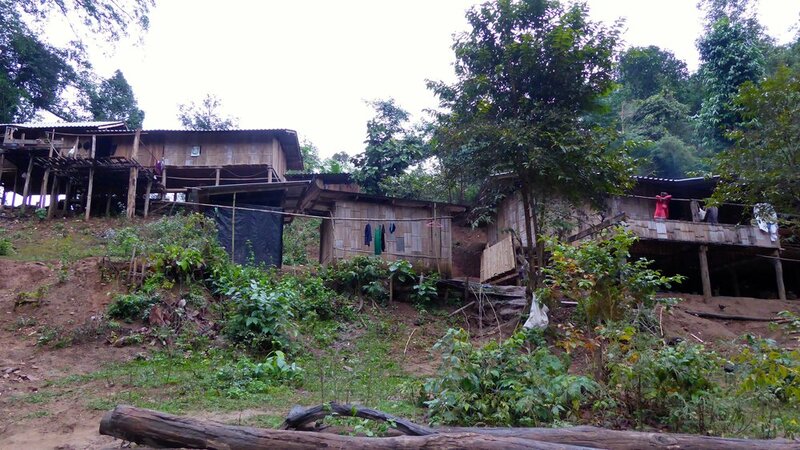 The village was small—only about 30 wooden huts with no electricity or running water, each perched up on stilts. Below each house was a farm with roosters, chickens, pigs, cats and dogs. Our group would stay in one of the huts. 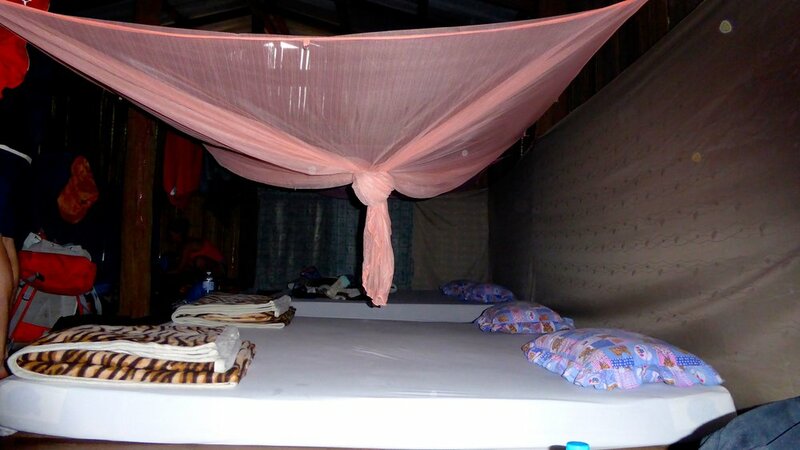 We each got our own bed with mosquito net and we shared two toilets out back. The shower of choice was the river stream running in front of the house. After a refreshing dip, we watched the village kids play football (soccer) and ate a delicious Thai dinner by candlelight while learning about village life from Sun as we sat around a campfire. 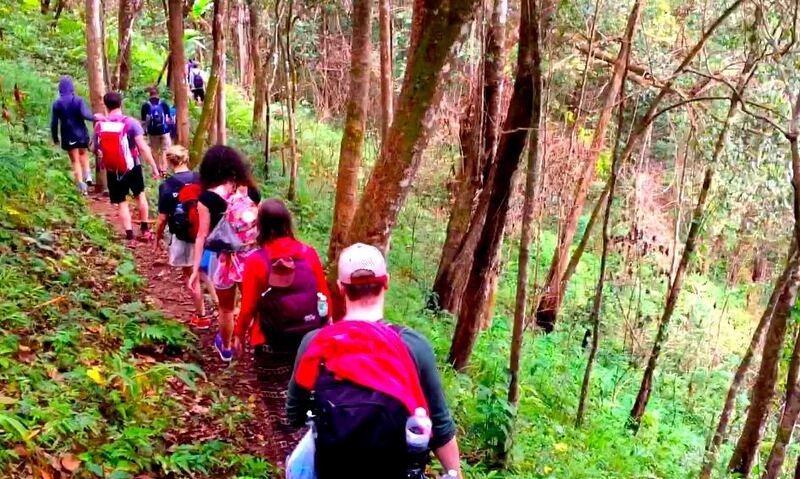 We woke to the rooster crowing a 5:30 and set out for another three-hour trek through the jungle. We soon found ourselves next to a quickly rushing stream. Just down river rapids could be heard lapping briskly. 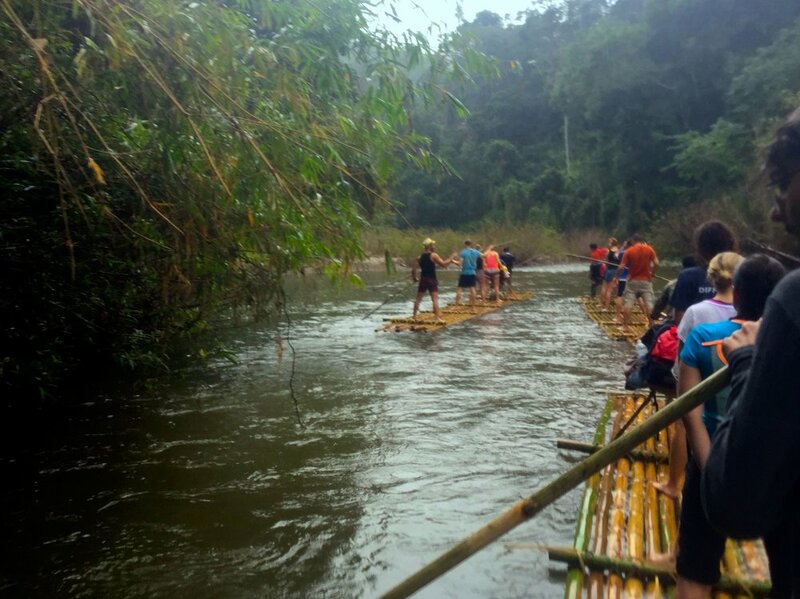 At the stream’s edge were three 15-foot long rafts made entirely out of bamboo shoots tied together with reeds. Rolando was tossed a bamboo stick and quickly learned that along with our local captain he’d be the one “rowing" our raft. This frankly was no small feat as it required him to paddle and turn the boat amid the rocks and rapids on the stream. We're happy to report our raft stayed upright (and our luggage stayed dry) despite the fact that Jenn and another passenger slipped off the raft and dove halfway into the river as we passed one of the bigger rapids. The experience was thrilling. After an hour we found ourselves down stream at a small restaurant and were greeted by the majestic sight of two elephants standing guard near the river’s edge. After a delicious meal of Ramen noodles, veggies and fresh fruit, we walked down toward the river to spend time with the elephants. At first we fed them watermelon and pineapple rinds and giant stalks of sugar cane. Their giant muscular trunks reached out to grab each piece and quickly devoured them with a powerful snap. They were endlessly hungry. After lunch it was time for a bath. One elephant walked down to the river and kneeled down. We splashed around it pouring water on it’s back to clean off the dirt and grime that had accumulated. These were truly majestic creatures—much larger and more powerful than we had imagined. 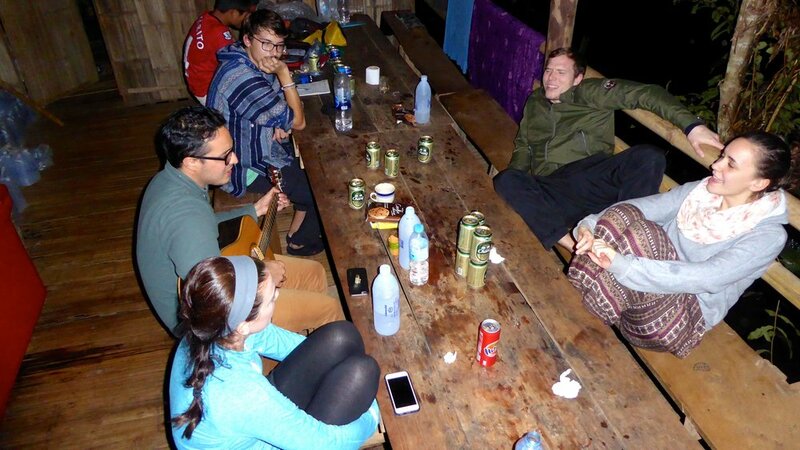 Later we returned to our rafts and made our way to another remote village where we spent the night laughing and talking about our experiences with our friends from the tour. The next day we took the rafts out one last time winding down stream and ending just outside of Chiang Mai. When we got back our hotel that afternoon we took a hot shower (BLISS!) and immediately collapsed into bed as we took in the amazing couple days we’d just experienced. We arrived on our red eye from Munich at 6:00AM Bangkok time. After herding through customs at the airport, we popped out into public transportation just as rush hour was in full swing. Talk about jumping right into the true Bangkok experience. We moved from airport metro, to public metro, to the SkyTrain, all the while we were squeezed among the mass of locals hurriedly making their way to work. After an hour of transfer we found our hotel and took a much needed nap. 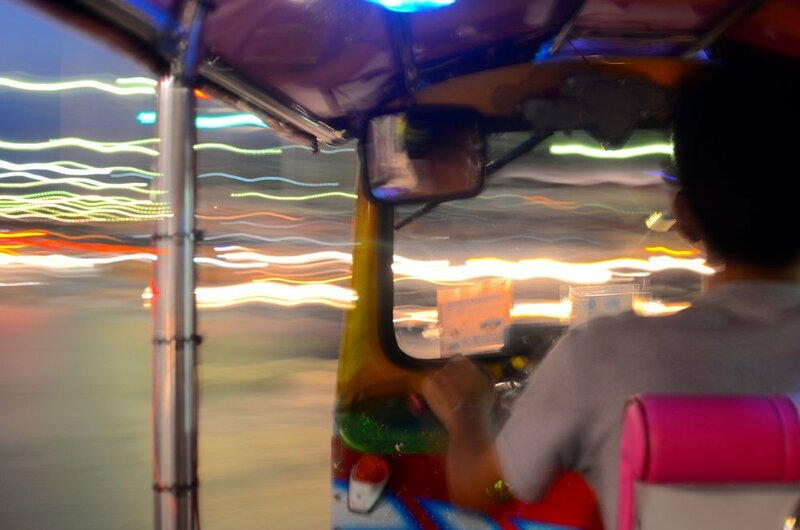 When we awoke and ventured out again, we learned that the hurried pace we witnessed in the morning was not just a feature of rush hour—it was just Bangkok. 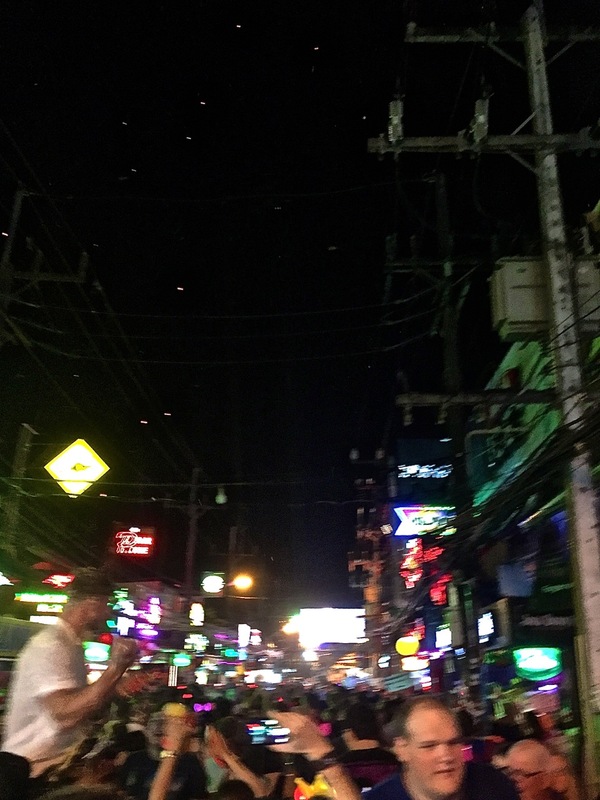 Bangkok is the epitome of sensory overload. As in many busy cities, horrible traffic is an unfortunate reality—there are flashing billboards and signs at every turn, sounds of cats and dogs, motorcycles, music from neighboring bars, people yelling, absolute opulence right next to absolute poverty. But in spite of all that (or perhaps because of it) Bangkok is amazing. It served as a wonderful introduction to South East Asia’s culture and traditions with all the comforts of the West (fancy hotels, access to any type of cuisine you could imagine, green parks) while adding more than a dash of the East (temples, long riverboats, crazy-looking food). 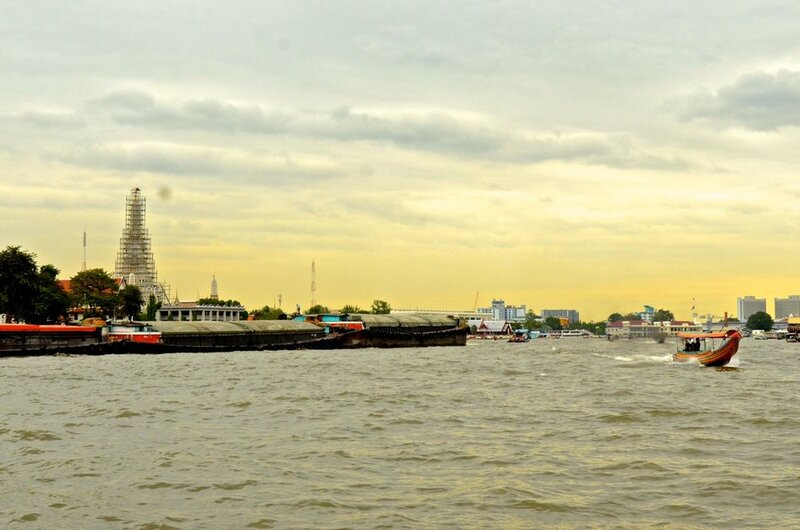 Bangkok isn’t a place to sit down and relax… it’s a place to actively explore with an open mind. And that’s exactly what we did. There are over 30,000 temples across the entire country of Thailand. And while they all offer something beautiful to look at, it’s quite possible for Westerners to get ‘templed out’ after the umpteenth visit. 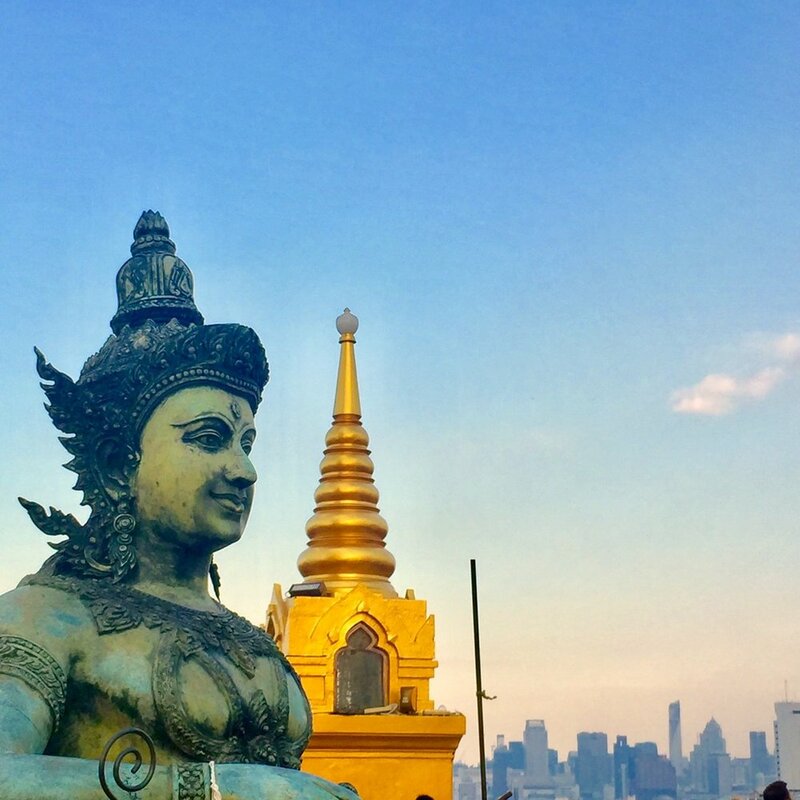 That said, we’d be remiss not to mention the temple visiting experience we had in Bangkok, Chiang Mai and Phuket as these visits added to our understanding of Thai culture and history. These beautiful buildings are simultaneous feats of architecture, galleries of art, keepers of history, political/military headquarters, and houses of worship. Here we’ll highlight just three of the dozens of temples we visited. 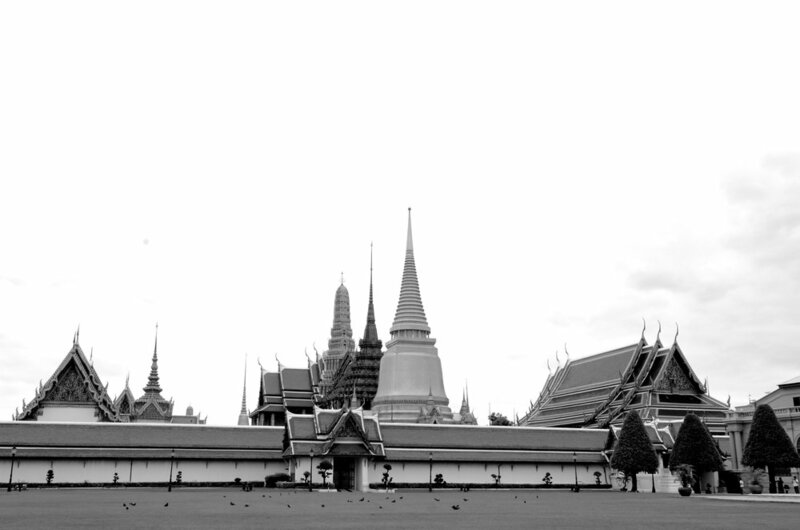 The first one we visited, Wat Phra Kaew ("The Temple of the Emerald Buddha") was one of the most jaw-dropping. This ornately decorated masterpiece was built on the grounds of the royal palace in Bangkok and houses the renowned Emerald Buddha which, as its name suggests, is a Buddha carved into a 66 cm block of jade. As you approach the temple you are struck by the ornate decoration, the orange and green tiled roof, the mosaic pillars, the looming golden towers and the gold leafed accents. The temple was built in the 18th century and is still used today for special religious ceremonies. Hopefully the pictures will share the beauty we observed in person. Next up: A 46-meter-long giant golden Buddha just chilling. Wat Pho (The Temple of the Reclining Buddha) is another of Bangkok’s famous temples. 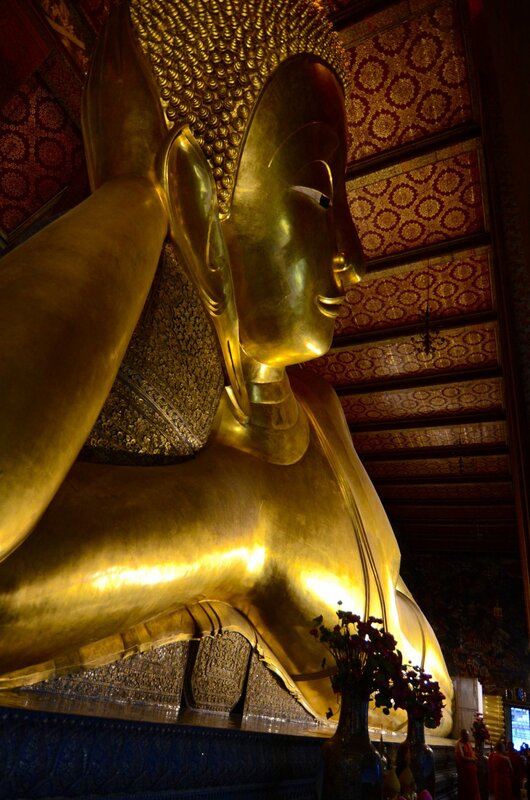 We were mesmerized once we stepped into the building housing the reclining Buddha – it’s so huge! The Buddha laying on his side with his arm under his head and is said to represent Buddha passing into Nirvana after his death. 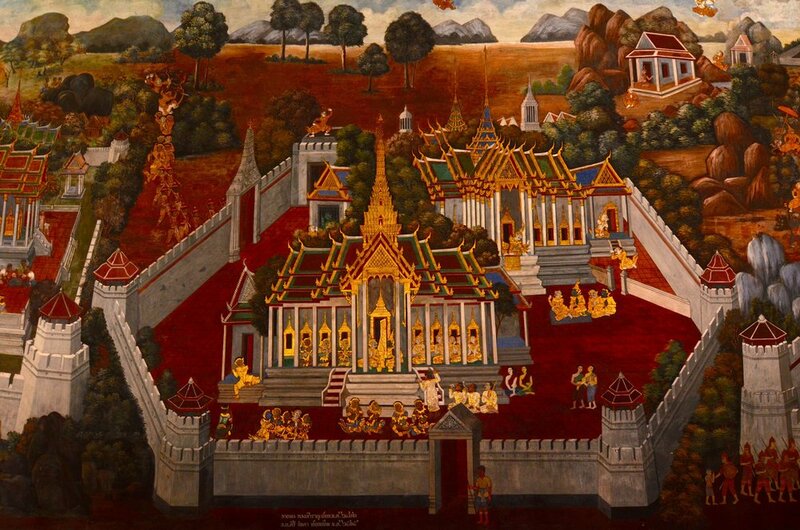 The last few temples were in Chiang Mai in Northern Thailand, which looks much like it did at its cultural height. Very few buildings populate its narrow streets, while temples peek above the rooftops. One such temple, Wat Chedi Luang, began construction in the 14th century and at 82 meters this brick tower was the tallest building in the entire city. It was partially destroyed in an earthquake and now stands at 60 meter, still peering over most buildings in Chiang Mai. While not as awe-inspiring as the gilded temples in Bangkok it is still a sight to behold. As an added benefit, the monks who live at Wat Chedi Luang offer a daily ‘Monk Chat’ where you can sit one-on-one with a monk to learn about their lifestyle and beliefs. 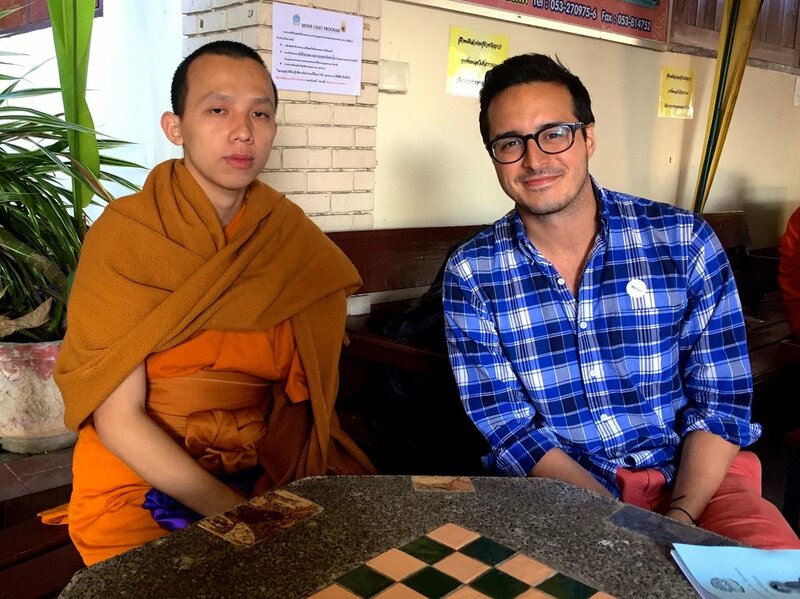 We talked to a man in his early 20s who moved from Laos to Chiang Mai to become a monk. This gave him access to a quality of education that wasn’t available to him back home. We learned that all practicing Buddhist males are expected to become monks for at least a few months during their lifetime, engaging in study, prayer, meditation, and abstaining from other ‘earthly pleasures’. They can choose to leave the monk-hood whenever they like. This monk’s advice to us lay people? Learn and understand the Four Nobel truths of Buddhism, as a deep understanding of these can lead to a more content life. We all experience dissatisfaction in life (sometimes translated as "suffering"). This dissatisfaction stems from clinging to the past or craving things we don’t have. If we can stop this clinging/craving we can be truly happy. In practicing mindfulness (through meditation and other methods) we can learn to appreciate life as it is, in the present and ultimately be less dissatisfied. For a simple, non-nonsense approach to the Buddhist philosophy (this can be surprisingly hard to find), we recommend the book “Buddhism Plain and Simple” by Steve Hagen. Next up: the magic of Cambodia, one of our favorite countries of the trip. Keep an eye out for the post!